We would like to invite parents and guardians with students registered for JK next year (or students who will be new to the school going into SK next year) to our Welcome to Kindergarten evening on May 1st, 2014, at 6:30 p.m. 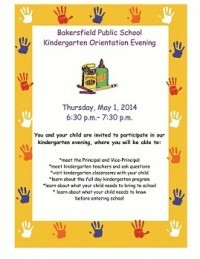 Please note, this event is for parents and students entering kindergarten for the first time in 2014-2015. For more information, please see the attached flyer. We look forward to meeting our future students and their families.